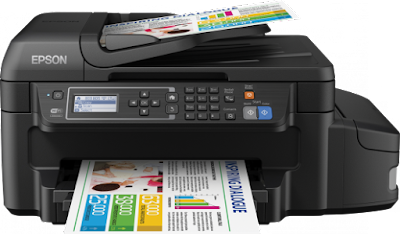 One essential tool that every home or small office needs is a decent wireless printer. Even if its only to print off your eBay address labels, printers still very much have their place for work and play, as long as they are considerate to the environment and your bank balance. We've found one that not only produces great quality A4 and A3 colour prints, but also won't need refilling for two whole years! 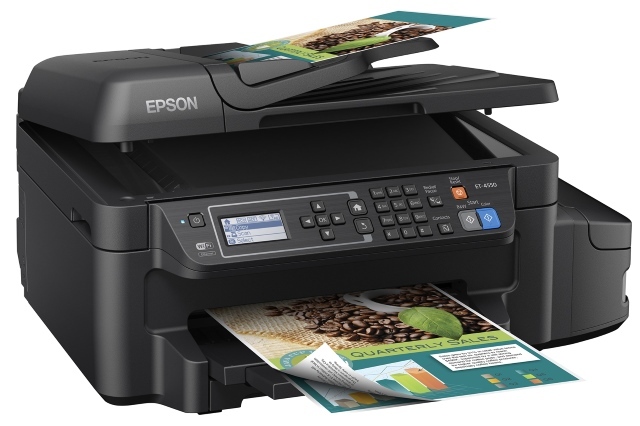 We review the Epson ECOTANK ET-4550 Printer. Obviously the headlines for this printer are about the ECOTANK technology that we'll look at later, but first the physical printer itself. The Epson ECOTANK ET-4550 Printer is a four-in-one unit that can print, copy, scan, and also fax. Yep, if you know someone in 1992 and would like to say hello, you can fax them. It can print both A4 and A3 (despite being relatively compact at just 50 cm wide), and can be connected to wirelessly. Plonk it in the middle of your office (or indeed your home) and anyone can easily send documents to it without any fuss. 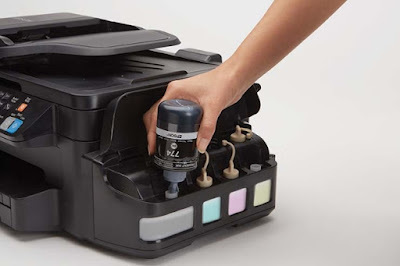 In terms of filling it with ink, the Epson ECOTANK ET-4550 Printer does not have a single cartridge to worry about. Included in the box along with the printer (and y'know, a plug, obviously) is enough ink to keep the printer going for two whole years! There are six colour refill bottles, as well as two larger black ink bottles, providing enough juice for 11,000 pages! Put that in a home environment, where you might print just a few sheets each week, and you have a printer that doesn't need refilling for a very long time. We don't know about you, but we're not sure if any of us have ever printed more than 11,000 pages in our entire lives. And one of us is a really bad failed novelist as well. You might think getting a liquid into an electrical device is a dangerous job, but refilling the different reservoirs is refreshingly easy. 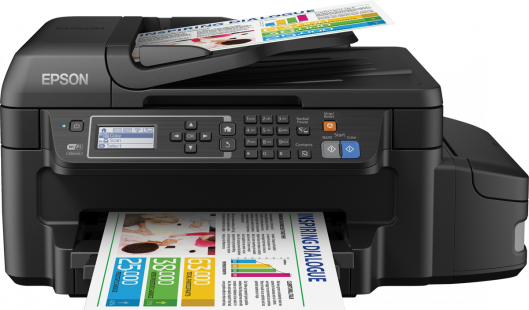 The Epson ECOTANK ET-4550 Printer even has a very effective low ink early warning system, letting you know that you'll soon have to top up the tanks. This info is clearly conveyed on the LCD screen on the front of the unit, as are other titbits of data such as WiFi connectivity and print job progress. The paper try will take abut 150 sheets, reducing the number of times you'll have to get off your bum to fill it, and depending on if the machine is already on and warmed up, it takes about three to five seconds from hitting send for the print job to start, over Test Pit Tower's WiFi. All the copies were very clear, with even full-colour images printing quickly, and the quality of the scans was, also, very good. One thing we didn't test was the fax capabilities. Because who use s a fax machine these days? Seriously, we didn't know anyone we could fax. Still, nice to have it there. Same reason you've still got that VCR in a cupboard, eh? Despite those high specs and economical outcomes, the Epson ECOTANK ET-4550 Printer is very easy to set up and use. Yes, its the ideal home printer, but because it can print so many copies at a fraction of the cost of a conventional printer, it will also serve a small to medium sized business very well.